In prior years the city had the ability to issue tax refunding bonds to purchase old bonds that had unfavorable interest rates. In short, when the cost of bonds went down the city could buy new bonds and use the money to refund old bonds thus lowering the annual interest costs. Unfortunately the city often used the opportunity to make the new bonds expire later than the existing bonds. They were kicking the can down the road so that they did not have to pay off the principal on the original bonds. Before the new law the city could evidently use this trick whenever they felt that interest rates justified the action. Evidently under the new law they will only be able to do this within a window 90 days before the published call date for the original bonds. According to the chart above the call date on bonds is typically 10 years after the bonds were issued. Bond interest costs fluctuate. 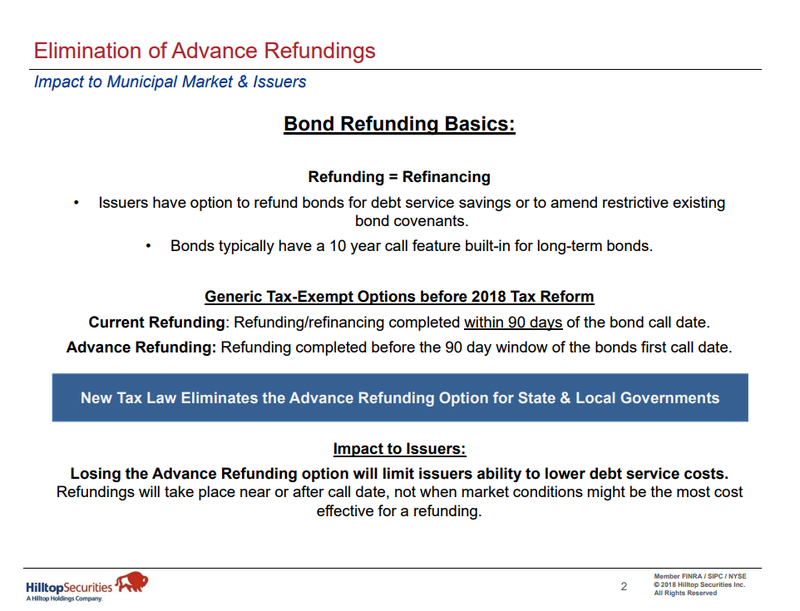 The city will now only be able to use refunding bonds 9 3/4 years after the bonds are issued. Interest rates might be higher or lower at that time. This will have a significant impact on the city budget. The spendthrifts on this and prior councils have put us in a box. This entry was posted on Wednesday, January 10th, 2018 at 5:00 AM and is filed under City government, Federal Government. You can follow any responses to this entry through the RSS 2.0 feed. You can leave a response, or trackback from your own site. El Paso will file bankruptcy. It’s not a question of if, but when. And the people who caused it, will not be around suffering the consequences. They will be living in other places. If El Taxo files bankruptcy and lowers their debt, interest, and payments, will the Property Taxes be reduced ? Somebody smarter than me on all the Bonds, paying, financing, re-financing , thing, maybe Brutus. But I have been in El Taxo more than 25 years and to the best of my knowledge, the home owners, taxpayers have NEVER gotten any tax CUTS. With the exception of the local MILLIONAIRES, BILLIONAIRES, who get tax CUTS, REBATES on everything, every project, every building, there are no tax cuts in El Taxo. These are the people who “Finance” the politicians, so the rebates, tax cuts for them, are “Pay back”. For the rest of US, our Property “Values” continue to be “Fabricated, inflated”, so that the El Taxo politicians CAN, WILL increase taxes. And of course they waste, spend everything THEY take from US. Never giving anything back. Tax, waste, spend, tax some more. Too much “Creative accounting” and now politicos get caught. BANKRUPTCY of El Taxo is coming. Can THEY tax homeowners enough to survive? THEY will certainly try.